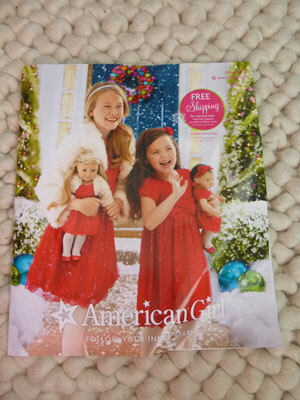 The holiday American Girl doll catalog just arrived at our home and my jaw often drops when I see the prices on all the cute clothes and accessories. Maybe you have someone in your life that is really excited about American Girl dolls or any aspect of the AG culture, but it’s just not in your budget or your jaw drops when you see the price tags on things. While my daughter does own an American Girl doll, we have found other ways to keep enjoying the American Girl doll culture without having to make additional major investments.I hope that some of my ideas will be helpful if you are finding that American Girl items are appearing on a Christmas or Birthday wish list for someone you buy for. Finding a deal on authentic 18″ American Girl doll can be hard, but it can be done. Follow deal sites that frequently post toy deals in case a sale pops up. There was one recently were American Girl has specific 18″ Doll sets with extra clothes and were selling those sets for up to 65% off. You can also check the sale section of the American Girl online store. You can try Craigslist or watching rummage sale ads to purchase a used one. Consider purchasing a mini American Girl doll. I have bought a couple of these for my daughter on Amazon and they almost always sell them for cheaper than the American Girl website and they have often come on sale for 50% off of retail, which is when I bought them. They come with a mini book too. Consider getting an 18″ doll that looks similar to the American Girl doll if you are unsure if the child will actually play with the doll or treat it respectfully. Younger kids might not know the difference between a real one and a knockoff like older children will. Getting the American Girl doll repaired if her hair is cut or she is drawn on can be very costly, so make sure they are ready for the real thing. FREE American Girl Apps through iTunes – there are currently 9 different apps that are free to download and play. Make a mental note to have your child participate in Summer Reading Programs. The last 2 summers there has been an American Girl chapter book on the FREE book list at Barnes and Noble. Other programs may have American Girl books to choose from as well. Take your picture in the American Girl Store with the Girl of the Year Display. There is usually a display that you can enter into for a photo opportunity (bring your own camera!) with that year’s featured doll. Purchase 18″ doll clothes from other retailers that sell them like Target, JoAnn Fabrics and Michaels. Watch for them to come on sale or when there are coupons from JoAnn’s and Michael’s that allow you to purchase one regular price item for 40%-50% off. Accessories and furniture is available for considerably less without the American Girl label from Target. My daughter would really like a horse for her doll for Christmas and it’s 1/3 the price for the Target version and you better believe I will be watching for it to come on sale. Enjoy the American Girl Bistro just for dessert! Eat a meal at some place more in your budget and check out the Bistro just for dessert. You may need reservations. They offer this cute trio of mini ice cream cones that you could share if your budget is tighter or there are other little dessert samplers to try as well. If you don’t have your American Girl doll with you or you don’t own one, they have plenty they will lend you while you are dining there and will bring out a high chair for the doll as well as a little tea service for the doll. Easy to Make American Girl Doll Clothes that include a tutu and knit hat and scarf. Matching Halter Tops for Girl and Doll that could easily be adapted to fit different sizes. Free American Girl Doll Dress Patterns that are quick, fun and easy. American Girl Doll Glass Magnets – Use that holiday catalog and make some magnets of their favorite dolls. These could make cute stocking stuffers. Doll Bedding that fits an 18″ Doll Bed – you might be able find a bed at Target, perhaps make your own or re-purpose a dresser drawer or a box in to a dresser and make this bedding from leftover scrap fabric or some outgrown kids clothes. My daughter has made some smaller length loom bracelets for her AG doll. Don’t underestimate the mini versions of crafts that kids can make for their dolls. Those mini-spoons you get when you sample gelato and ice cream at a shoppe make perfect doll spoons. Use 40%-50% coupons to JoAnn’s and Michael’s to buy American Girl Crafts sets from there or watch for them to be marked down on Amazon. 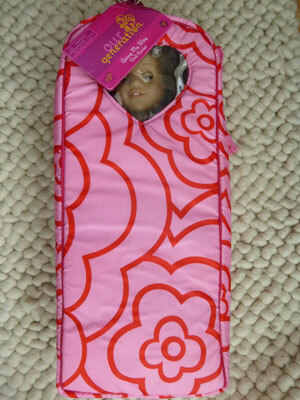 Is your daughter in love with American Girl? How do you find ways to save? Thanks for the ideas on where to buy clothing! We are getting my daughter her first American Girl Doll for Christmas this year and she was wondering where to get clothes to change outfits! She is going to be so excited and you can find so many easy to make clothes ideas, just like the ones I shared above. Thanks SO much for this post. I have a three year old, and we’re not at the stage where she wants an American girl doll. She’d have to know how to keep good care of it before I consider saying yes. Wow these are such great tips. American girl dolls can be expensive and I would buy one for an older child not a young child just do to the expense and an older child would take better care of the doll. I like the mini version for toddlers, they are cost effective and you don’t have to worry that you spent a lot on a doll, because the cost is a lot lower. I have been considering buying one of these dolls and these tips come in very handy. Thanks for sharing. Oh my when I Was younger I wanted an American Girl doll so badly, but the price tag was WAY out of my range!! Haha I remember I had a subscription to the magazine though and would play with the paper dolls they had inside. Good tips! I didn’t have one growing up or even learn about it until I had a daughter. So, are you saying Krystal that there used to be paper dolls inside the catalogs? That would be pretty cool. My ten year old fell in love with the American Girl dolls when she was five. So we spent the summer checking out the “Meet Kirsten, Meet Josephina, etc” books from the library. After three months of reading together she picked what would be her “one and only” American Girl Doll. I found it on Craigslist, and she got her for Christmas. Each year for her birthday Kirsten got a clean-up at the store, fixing the hair and cleaning scuffs. My daughter did get the six books as presents over the year (birthday. back to school, etc) and recently the Kirsten Mystery. We mostly made the clothes and furniture, fun times with parents and grandparents. Because my daughter knew this doll would be her “one and only” she loved her fiercely, took her everywhere, slept with her every night, and never lost her. I will say this, for a doll that is now 30 years old, she has held up well to a LOT of loving…and as a relief to Mommy, when that is her daughter’s favorite toy, she can usually be fixed if something happens. Now, at ten, my daughter is a fashionista who wants to design “beautiful, nice, elegant (not short-short) clothes.” Guess who is a great model to try out small outfits on, where my daughter can use scraps to design an outfit, before making it for herself? My daughter loves to do that too. She just made a scarf for herself and her doll (I will be sharing that tutorial next month). She is always thinking what things she could make for her dolls. Budding fashion designers we have. This is a great guide! I am surrounded by boys so no dolls here. I will share this post with my ex-sister-in-law, my niece might love American Girl Dolls in a few years! I’ve had luck in a local “upscale” neighborhood finding not one but two American Girl Dolls, the first one my daughter was much too young for (plus it was a limited doll) and I sold her for a nice profit online, I paid $20 for that doll with 2 outfits and sold her for around $120. The second doll I found at a local estate sale for $10, I bought her an outfit online and was deemed the “best mom ever” when I gave it to my daughter for her Birthday last year. Thanks for all the tips! Oh my! Those are really good deals! Thanks for sharing those. I will be checking them out! Awwww…. my husband actually works for a doll company so we have a million and 1 dolls so we have way too much and I don’t even have a daughter! I’ve seen how nice American Girl dolls are though and totally understand why little girls are so into them. Are there American Girl outlet stores around? I’ve seen one in the past, but it was a long time ago. Remember to look at thrift and consignment shops too. I recently noticed several books one shop I visit. My daughter did see a book at a thrift store but we were heading across the store to meet my husband and when we came back 15 minutes later, it was gone. Darn. There’s also a fb site. Thanks Mary Kay! I will talk to her next time I am in. American dolls make me want to have a few even I am too old to having one. Aw, American Girl holds a very special place in my heart. I was a young girl when my grandmother gave me Molly, her trunk, bed and clothes. My grandmother loved shopping the benefit sale for her grand daughters. My daughter now plays with my doll along with her bitty baby, Kit and a doll of the year. The Bitty Baby is the only one I purchased new (on an employee discount – friend of a friend). The other dolls I found at a rummage sale for $7 each, along with a HUGE bag of clothes, Bitty Baby crib, changing table, double stroller, armoire and bed. Everything was $7 or less. I found everything MANY years ago but I have such a love for AG that I bought everything. I still have Samantha in hiding, I’m not sure if I’ll sell it or give it to my daughter. We have so much fun creating stuff for her dolls. K-Mart has cute clothes for girls and their dolls. I don’t care for their 18″ dolls (they want $30). I bought the Target doll which is adorable and affordable. I bought a cute summer outfit 60% off! They also have accessories for girls and their dolls. Really cute stuff! We have just gotten out of the doll stage at our house–but for several years, my daughter’s dearest passion was her family of 18-inchers, and most of what we got or made for them was done as economically as possible. The dolls: she had assortment and added to them over several years. She had a couple of knockoff dolls from yard sales and Michael’s; she had two AGs that were bought on Ebay; and she saved her money, towards the end, and bought her own choice of new AG. The furniture: mostly made out of cardboard and scraps. Carton lids for beds, slipcovered boxes for chairs (you can find a tutorial on our blog), some items bought at thrift stores. We tried to stay as multipurpose as possible. I sewed and crocheted bedding and afghans, and my daughter improvised some of her own bedding. The clothes: mostly sewn or crocheted at home from fabric, leather and yarn scraps; occasionally bought at thrift stores or from friends who had outgrown their doll interests. The extras, like a camping kit: made up from things we already had or could recycle. The accessories: mostly made by my daughter, and that was a great deal of the fun of it. She also thrifted many items, and picked up a few doll-sized things at the dollar store and Wal-mart. I would say that the best part of this, at least financially, is now that my daughter has finally packed away most of her doll things, is that there is no great sense of waste. We, and she, put more time than money into giving her what she needed to enjoy the dolls. As a fan off American Girl since its inception by Pleasant Rolland three decades ago, must confess it is a joy to read about families who choose to treasure their toys. The dolls I invested in in the 80’s are stored out-of-sight until the next generation gets a wee bit older (we broke down and gave the four-year_old a Target knockoff so the adults can stay in practice making stuff). The historical dolls are in fabulous condition. My only disappointment is Mattel’s shift to pop culture and dropping the wonderful historical characters and books. Meanwhile, now there is a British company offering British historical dolls. The world turns!